Recently Motorola changed its policy and produced several interesting phones undertime. 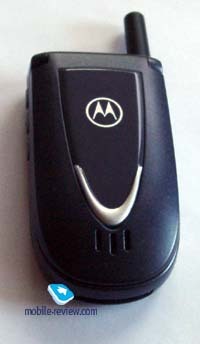 Just users get used to Motorola v50, the most modern folder-type fashion phone, the next model v66 launches the market. These phones differ in design and technological capabilities. 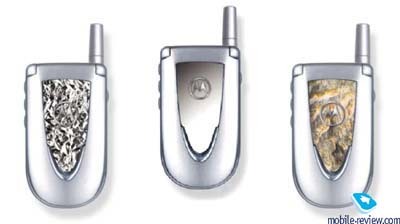 Design of v66 resembles other folder type phones from Motorola, but it is less squared. The phone has smaller dimensions - 84 x 44 x 21 mm. The weight is only 79 grams. One of the by-effects of weight decreasing became decreasing of the battery capacity. This model has lithium-ion battery of 500 mAh capacity. However, according to the manufacturer, the phone can work up to 180 hours in the standby mode and up to 3 hours in the talk mode. In reality the operating time of the phone was about 3 days in case of 20 minutes of talking a day. If you are an active talker, your phone will work about 2 days. Time of full re-charging of the phone is a little bit more than 2 hours. While re-charging you can’t understand the amount of charge in your battery, though a battery indicator is blinked and you can see a message. By the way, travel adapter of v66 has a new slot and it is not compatible to old models. It is typical to all new models from this company. If you look at this adapter, you can notice that outwardly only a plug shape was changed, nothing else. SIM-card holder is placed not usually. It is located under a special SIM-card cover plate, which is positioned in the front of the phone. Holder construction is usual and quite reliable. But pay attention that the cover is fixed in three points, its lower part is raised a little bit and there is a small hollow in the phone, which helps to remove the cover. This construction is applied to spare the space. In the standard kit two extra cover plates of different colors will be included. It is also possible to purchase covers of other colors. 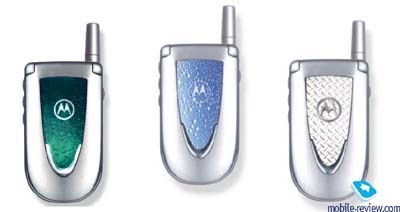 It’s a new solution for Motorola, earlier all models has an ascetic design. This model is available in two colours in Russia - silver and silver-dark-blue. 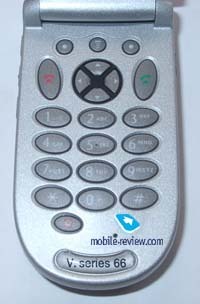 The phone has rather a small keypad, what can be explained by its dimensions. Keys are small; it’s not always convenient to press them. Functional keys, which are positioned under a display, are the most uncomfortable. They are small and deeply placed in the phone. Smart-button remains on the left-hand side. This key gives an access to many features, depending on the initial menu item. The smart-button is a heritage of old models. It wasn’t used in T280, but it was left here to help users get used to this new phone. A new type of menu interface is used in this model. 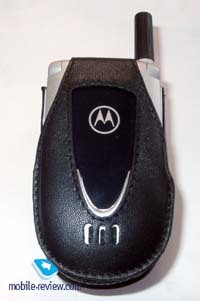 It is similar to all new models produced by this company, for example Motorola T280 also has the same menu structure. New version of menu is friendlier: the most frequently used items are located in special items. Shortcut number navigation is not available. The user can set only 9 shortcuts to access a designed menu item as quick as possible. In our opinion it is quite sufficient for easy navigation. By the way, the display of v66 is also very interesting. A user could change font size. Apart from line with icons and tips to the soft keys use, two or three text lines will be displayed when the font size is shrank. The display has a resolution of 64х96 pixels. 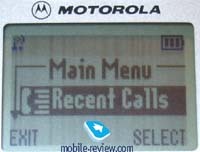 The new feature is a possibility to select a display backlighting (red, orange, green); it is the first GSM-phone form Motorola with this function. You can also notice a service indicator, which is situated on the upper part of the phone. This LED is seen even when the phone is closed. 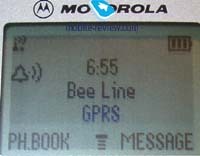 When the phone is registered to a network, the indicator blinked green, otherwise, it is red. Green-red indicator means that you have an incoming call and yellow-green light means that you receive a message. By the way you can switch off this option, as for me, it is not very useful. 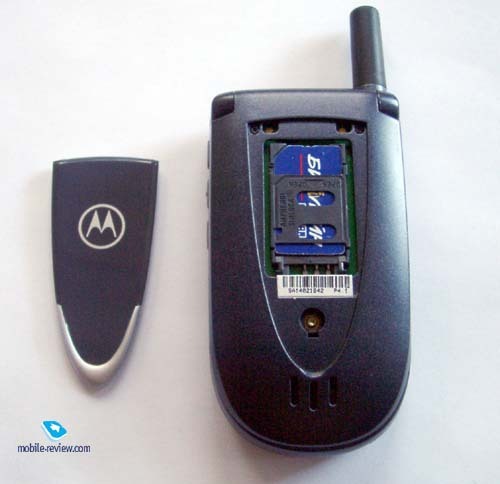 We don’t think that it is necessary to describe all features of v66, they are similar to Motorola T280. I would like to say only about some differences of these two phones. In spite of that one can add several phone numbers in the phonebook, all records will be different, i.e. in the list one can see several equal names with different phone numbers. It’s also impossible to add post address, e-mail address and other information to a contact. Currency converter is not available. There is only one cell in a calculator, where you could record one currency rate as a constant. Alarm clock is also absent here, but there is an organizer with signal reminders. The new phone has lesser display and it causes outward changes of several menu items. Portable handsfree with integrated FM-radio is available as an extra accessory. It will be supported by the phone firmware, what allows to control it from the phone and search radio stations by their titles (they should be recorded to the phone beforehand). Three games are pre-installed in the phone, but they are really awful. The first game is Black Jack, which is not very interesting, the second one – is also boring. The last one - Paddleball is dull, you mission is to move a paddle to strike a ball, what is very easy to do. When you miss it, the game is over. Other features of v66 and T280 are identical, they are introduced in the list (see below). CD-ROM with software GPRS Wizard. So, v66 has small dimensions and rich features. The connection quality is average, sometimes echo is appeared. As for me, it was very difficult to get used to this phone, when it was opened, I felt discomfort. However, I can’t explain this peculiarity. For example, I didn’t have such problems with v50. Volume of the loudspeaker is sufficient to talk everywhere even in noisy places. Among shortcomings, we can notice not handy keypad and weak vibrating alert. All advantages were mentioned above. But as for me the shortcomings outweighed all virtues of this model. In September 2001 the phone cost about 370-390 USD. It has rich features, which are mostly similar to Motorola T280, but it is much lighter. The advantage is that it is a tri-band phone (GSM900/1800/1900), what allows to use it in USA. So, v66 is one of the first fashion phones with the features of business phone. We think that this fashion phone is purchased by those who try to underline their status, and they are not worry about the phone convenience. The main criteria are price and popularity of the brand. Our assumption is proved by Motorola, which doesn’t include software (to work with GPRS) and data adapter in the standard kit. 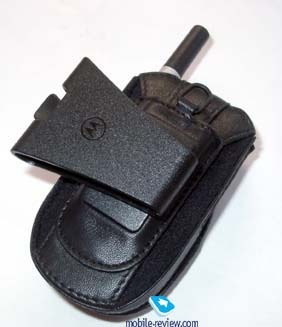 The delivery box contains only the phone, portable handsfree and a nice leather case. We think that sales of v66 will be comparable to sales of v50. But v66 won’t be a very popular phone because of high price and different inconveniences.